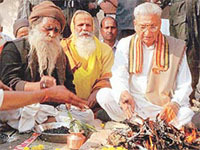 The BJP seems to be losing the battle on its own as none other than its MP and Seer of the Gorakh Nath temple, Aditya Nath Maharaj, who wields great influence here, has fielded three candidates against the official nominees. Day-to-day problems like unemployment, unkempt roads, closed industries, absence of potable water, lack of educational opportunities and neglect of the trading community are beginning to haunt political parties as national issues fail to evoke a sympathetic cord with the electorate in Uttar Pradesh. Cong playing double or quits in UP? After many number of EVM buttons were pressed by about 55 per cent electorate in Uttaranchal to cast their vote during the Assembly poll on Thursday. Situated between the two most significant Hindu pilgrimage cities of Allahabad and Varanasi, the electorate will decide the fate of many political bigwigs here on February 21. “Photo kya kheechte ho, Rabri ko khecho, usne mere pati ko marwa dala...”, screamed the widow of Shahabad District Forest Officer Sanjay Singh, who was killed by the MCC, the Left wing militants in the Kaimur region of west Bihar on Friday. Rashtriya Janata Dal President and former Bihar Chief Minister Laloo Prasad Yadav said today the BJP was misleading the countrymen in the name of waging a fight against terrorism. An estimated 60 to 65 per cent voters exercised their franchise in repolling in 16 polling booths of six Assembly constituencies in Uttar Pradesh today, election office sources said here. Naxalites seeking the boycott of the panchayat poll attacked the house of a Congress candidate, blew up a number of vehicles and beat up his two sons at Jamadeipentha village, about 10 km from here last night, the police said today. Popular actress Kajol holds the Filmfare Best Actress Award during the 47th Annual Filmfare Awards in Bombay, on Saturday night. The actress was awarded the prize for the film ‘Kabhi Khushi Kabi Gham’. Aamir Khan’s “Lagaan”, which has been shortlisted for the Oscars, dominated the prestigious Filmfare awards here bagging eight honours whereas “Dil Chahta Hai”, finished a close second picking up seven trophies. “Lagaan”, which dwells around the story of a villager Bhuvan and his leadership mantle to brave the worse crisis for the hamlet on the backdrop of colonial rule, walked away with Best Film trophy besides the best story and Best Direction awards for Ashutosh Gowariker here last night. As the issue of funding of Aftab Ansari, one of the prime suspects in the attack on American Center in Kolkata, is getting murkier, the CBI plans to rope in the Enforcement Directorate to carry out a thorough probe to trace the route through which the money was being pumped into the country to finance anti-national activities. Gujarat’s economy is in the doldrums. Growth rate came down to just 4.5 per cent; the state budgetary deficit rose to 5 per cent from 2.15; debt rose to 27 per cent from 17; revenue went up by 13 per cent, but expenditure increased by 19 per cent; and the burden of subsidies soared to Rs 13,000 crore from Rs 5,700 crore. Renowned media personality Mark Tully today held Indian bureaucrats, rather than politicians, responsible for the poor governance of the country. A change in uniform for women police officers figures on the agenda of the first national conference for women in police. The three-day conference is aimed at forging a new future for women in police who constitute a little less than 3 per cent of the 13 lakh-strong police force in the country. Two interesting developments have taken place in respect of the two-child law in Madhya Pradesh. One is that a woman Sarpanch and her husband (who is a panch) have given for adoption their third child born on November 18,2001. Five BSF personnel, including a Company Commander, posted on border close to Pakistan, have been suspended on charges of dereliction to duty, official sources said today. The YWCA's 55 Annual Flower Show in New Delhi welcomes the spring with a riot of colour. A unique folklore Museum in Mysore is an effort to preserve heritage and give the glimpse of the past. Aditya Nath Maharaj, popularly known here as "Baba" has fielded candidates against the BJP nominees here in Gorakhpur City, Pipraich and Mundera Bazar (reserved) constituencies. The BJP seems to be more worried about his impact on the performance of its official candidates than the challenge it is going to face from other Opposition parties like Mr Mulayam Singh Yadav’s Samajwadi Party and Ms Mayawati’s Bahujan Samaj Party (BSP). The BJP’s fear was clearly evident from the fact that none other than Prime Minister Atal Behari Vajpayee refrained from criticising "Baba" for the gross indiscipline shown by him by fielding candidates against official nominees during his election rally here yesterday. Mr Vajpayee also overlooked the fact that Aditya Nath was not present at the election rally, while all other top leaders, including Chief Minister Rajnath Singh shared the dais. Another notable feature of the rally was the absence of Mr Jitendra Prasad Jaiswal, an independent candidate backed by the BJP from Pipraich, against whom Aditya Nath has fielded Mr Deepak Aggarwal, a first-timer, under the banner of the Hindu Mahasabha. Surprisingly, the temple Seer is backing the BJP candidates in four other seats in and around Gorakhpur City. Even the supporters of BJP’s official candidates are skeptical of the prospects of the party in the elections on February 21 as they have still not found a solution to clear the "Baba cloud" hovering over them. Many BJP workers, realising the futility of supporting official candidates, have switched their flanks and are supporting the candidates put up by Aditya Nath in these constituencies. At the outset, it might seem that it would be a cakewalk for the nominess of "Baba" in the constituencies of Gorakhpur City, Pipraich and Mundera. But Aditya Nath, who expressed his ire against the BJP for not giving tickets to his pupils seems to be worried as the outcome of this poll has become a prestige issue for him. The victory of his candidates in these constituencies will bolster the image of "Baba", who has recently taken over as the Seer from Baba Avaidya Nath, a former MP from Gorakhpur. Otherwise, his impact on politics will dip down considerably which in turn will affect the Hindutva movement launched by him. All said and done, Aditya Nath strongly defended his decision to field his candidates against the BJP nominee, saying that the official candidates’ image among the people was "very bad" and thus they were very weak candidates. "More than the party, I give importance to protect the Hindutva ideology and that is why I have fielded my candidates as the BJP candidates will lose hands down. This will only help other parties like the Samajwadi Party and the BSP to wrest the seats," Aditya Nath told The Tribune here today, minutes before he was to lead a campaign procession in favour of Hindu Mahasabha candidate from Gorakhpur City, Dr Radha Mohan Das Aggarwal. Asked why he did not attend the Prime Minister’s election rally yesterday, Aditya Nath said: "I was not informed about the Prime Minister’s meeting. Moreover, I was campaigning in the Mundera constituency for the Hindu Mahasabha candidate." 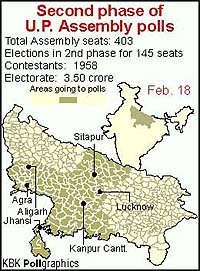 If one leaves the three constituencies — Gorakhpur City, Pipraich and Mundera — traditionally BJP bastions, in the other four constituencies — Sahjanwa, Maniram, Kaudiram and Maharajganj Sadar — the saffron colour seems to be fading while the Samajwadi Party is going strong and the BSP is closely following it. ‘‘Not only in cities and towns, the Ram temple is not an issue even in villages and townships. But after almost a decade of casteist and communal politics, developmental issues are beginning to catch the electorate’s attention”, a college lecturer in Unnao, Ms Sunita Arya, pointed out. In Etawah, where Union Home Minister L K Advani’s public meeting had to be cancelled because of heavy rains, Mr Ashok Verma’s words, as he pushed his stuck car out of a pothole, were an apt comment on the prevailing situation. ‘‘Mulayam Singh ki sarkar dekhi aur ab BJP ki sarkar bhi dekh li Hamara Etawah wahin ka wahin raha ,’’he said. “Etawah has been neglected by one and all because it is situated between Agra and Kanpur”, cyber cafe owner Asim Malhotra said commenting on the state of neglect that the city had been suffering despite having one of the local lads as the Chief Minister of the state thrice. Dhaba owner Ram Naresh in Sarsaul expressed dissatisfaction saying that political parties only make promises but forget them as soon as they get elected. “Ham ko to yahin rahna aur marna hai. Neta to kabhi mandir le kar aate hain to kabhi kuch aur, par hamare rozgar aur pet ki koi chinta nahin karta,’’ grocery store owner Jeevan Ram commented when asked about trends in Fatehpur. “They are very good at making laws which make our lives more complicated as the law enforcement agencies get another excuse to harass us and extract money”, medical shop owner Ajit Kesharwani said in a bitter tone when asked about the prospect of the sitting MLA from Allhabad (south), Mr Keshri Nath Tripathi. Ms Sofia Shami of Fateh Muhamad Purwa, who admitted having exercised her voting right four times, lamented that the Mandal issue had fragmented the society so much that development of infrastructure and other facilities had taken a back seat. “They had promised to get Allahabad University a status of the central university”, university lecturer Kiran Trivedi said adding that the number of unemployed graduates were increasing but neither the Centre nor the state government had any concrete plans for improving the situation. After many number of EVM buttons were pressed by about 55 per cent electorate in Uttaranchal to cast their vote during the Assembly poll on Thursday, a single hidden button on each of the machines will be pressed later to reveal the final data stored in the machines’ micro-chip. But much before the time when the “result” button will be actually pressed to decide the fate of over 900 candidates for 70 state Assembly seats on February 24, there speculations are rife in the state on the final outcome. Even though vague, the available indications on voting pattern point to a possibility of a hung Assembly in the state with the Congress and the BJP running neck-to-neck in the elections on a majority of seats. According to some, this has mainly been because of the electorate ignoring regional parties as well as local issues and rallying behind the two mainstream political parties. In addition, the last moment polarisation of the Muslim vote in favour of the Congress could cause significant losses to the Samajwadi Party which claims to have the support of the community. In contrast to projections made earlier for the Congress, this factor could help secure a few more seats for the party, a possibility that has brought smiles back in the Congress camp. The regional parties with a host of contentious issues have been largely ignored by the electorate. The Uttarakhand Kranti Dal had focussed on the location of the state’s capital as the main issue, which it said would shift to Gairsain, if elected. In its 36-point agenda, some issues were imposition of Article 371 to check the sale of the land to ‘outsiders’, rectification of shortcomings in the state’s formation, speedy division of assets with UP, 80 per cent reservation for locals in medical, engineering and other colleges of the state, and justice for victims of the Mussoorie, Khatima, Muzaffarnagar. Mr Dhirendra Pratap, a senior Congress functionary, while expressing satisfaction over the voting percentage as well as the available pattern, said the average voter turnout was roughly the same as it used to be in this region in undivided Uttar Pradesh. He said the electorate had always cast votes on national issues in the past elections. But in view of further fragmentation of the earlier 22 Assembly seats into smaller 70 constituencies, it was earlier thought that local issues and personalities would cast their influence. But the casting of votes on national issues rather than on local issues was not only a major surprise but also a “healthy sign” for the state, he added. Topping the list of those seeking a favourable verdict on their political fate is father and son combine of Lokpati Tripathi and Rajeshpati Tripathi, heirs of legacy of Pt Kamlapati Tripathi who in seventies led the Congress from the front. While the father is a Congress candidate in the Assembly elections from Majhwa segment of the parliamentary constituency, the son is the Congress challenger in the Lok Sabha byelection, which is being held due to the murder of bandit queen Phoolan Devi. Bandit queen Phoolan Devi’s legacy is also at stake as both the Samajwadi candidate Ramrati Bind and Phoolan’s younger sister, Ms Munni Devi contesting on the Rashtriya Kranti Party ticket are campaigning hard to get the electorate’s stamp of approval. While the Samajwadi Party supremo Mulayam Singh Yadav, who launched Phoolan Devi on the political stage in 1996, is obviously appealing to the voters to send his party’s candidate to Lucknow for making him the Chief Minister, Ms Munni Devi is not shying away telling the electorate that she was the right claimant to her sister’s legacy as her deceased sister was disillusioned with her party. The Bahujan Samaj Party (BSP), which had been coming third in the last three Lok Sabha polls as former Lok Sabha BJP MP Veerendra Singh and SP’s Phoolan Devi contested against each other with the former winning the seat once and latter two times, has put up Mr Narendra Singh Kushwaha and is hoping to wrest the seat this time by combining the Dalit strength with the Kushwahas and the Muslims. Incidentally, Mr Veerendra Singh, who has been replaced this time by the BJP high command by a sitting MLA Rachandra Maurya, had won this seat in 1991 in the wake of Ram mandir wave. “Photo kya kheechte ho, Rabri ko khecho, usne mere pati ko marwa dala...”, screamed the widow of Shahabad District Forest Officer (DFO) Sanjay Singh, who was killed by the MCC, the Left wing militants in the Kaimur region of west Bihar on Friday. Annu (26) pointed to the failure of the state government in providing security to the slain DFO despite intelligence reports of his being on the top of the MCC hit list. This reveals the criminal face of the MCC which in the garb of a Left wing resistance to the democratic system has started a parallel reign of extortion and joined hands with all types of Mafiosi, specially the jungle and quarry Mafiosi in Bihar and Jharkhand. Sanjay was killed by MCC men as he was fighting alone a battle against the forest and stone quarry Mafiosi who provide the MCC with easy money and dynamite. The MCC getting a ‘contract’ from the Mafiosi to kill him is what the truth seems to be. State DGP R.R. Prasad too admits that. The bodyguard of the DFO, who was also held captive and was released later by the MCC told the media that the MCC held a ‘kangaroo court’ and accused him of not paying ‘allowance’ (popularly referred to as ‘levy’ in the MCC vocabulary) to the MCC in the various development works in their area. 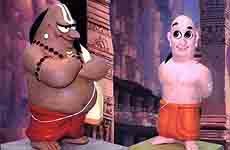 He said that Sanjay kept a brave face and refused to pay even Rs 500 to them. Initially the MCC captors demanded Rs 5 lakh for the release of the DFO and sent the bodyguard and other staff in a jeep to get the money. When the bodyguard returned with cops, he found Sanjay in a pool of blood. This shows that the MCC militants had already made up their mind to kill the DFO and the money demand as ransom was a facade. The bodyguard also said the villagers present in the ‘kangaroo court’ made strong appeals not to harm the DFO as he was pro-poor and honest, but the MCC captors chased them away by firing into the air. That also proves that the MCC had got a contract to kill. The hands of Mafiosi is confirmed by the fact that of late they had stopped paying levy and the supply of dynamites to the MCC as Sanjay had got stopped several illegal stone quarrying plants and had made the life for forest Mafiosi tough. Mr Ashish Ranjan Sinha, Additional DGP, said Sanjay was a brave officer and he had hit the levy collection of the MCC badly. Rashtriya Janata Dal (RJD) President and former Bihar Chief Minister Laloo Prasad Yadav said today the BJP was misleading the countrymen in the name of waging a fight against terrorism. Addressing election meetings in Basti and Siddharthnagar districts, Mr Yadav said the BJP-led Central Government had been a failure as far as ensuring national security was concerned. “The attack on our Parliament was the biggest proof of that,” he added. No untoward incident was reported from anywhere and the repolling passed off peacefully, they added. The ultras, in fatigues, also kidnapped three villagers and subsequently escaped unhurt, the police said. About 25 Naxalites, including a few women, entered the village shouting slogans asking people to boycott the panchayat poll. They went to the residence of the Congress candidate in the zila parishad elections and president of Rayagada district Congress unit Doki Satyanarayana and assaulted his two sons. 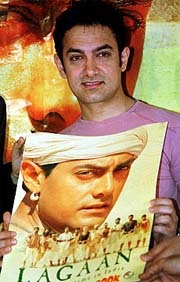 Aamir Khan poses with a copy of film-based comic of his Hindi film "Lagaan" in Mubai in this file photograph dated February 8, 2002. Khan won the Best Actor Award for his role in the film at the 47th Annual Filmfare Awards in Mumbai on Saturday. Aamir Khan’s “Lagaan”, which has been shortlisted for the Oscars, dominated the prestigious Filmfare awards here bagging eight honours whereas “Dil Chahta Hai”, finished a close second picking up seven trophies. “Lagaan”, which dwells around the story of a villager Bhuvan and his leadership mantle to brave the worse crisis for the hamlet on the backdrop of colonial rule, walked away with Best Film trophy besides the best story and Best Direction awards for Ashutosh Gowariker here last night. Aamir Khan was judged the Best Actor while other awards it got were in the categories of Best Lyrics (Javed Akhtar), Best Female Singer (Alka Yagnik), Best Male Singer (Udit Narayan) and best music (A.R. Rahman). Presenting the award for the Best Film at a glittering ceremony, upcoming star Abhishekh Bachchan remarked “the film is going to make India proud” amid repeated good wishes to the “Lagaan” team for the Oscars from the show’s principal navigators Javed Jaffrey and Archana Puransingh. “Dil Chahta Hai” bagged trophies, including Critics Best Film award, Best Supporting award for Akshay Khanna, award for Best Comic Performance to Saif Ali Khan, Best Screenplay for Farhan Akhtar, Best Choreography for Farah Khan and Best Editing for Srikant Prasad. The film’s music director trio of Shankar, Ehsan and Loy were given the special R.D. Burman Award for upcoming music. Kajol was judged the Best Actress for her hilarious role as a “Chandni Chowk girl settled in the West” for the film “Kabhie Khushi Kabhie Gham”. In Critics Award for actors, Amitabh Bachchan walked away with the trophy for his role in “Aks”. Receiving the award, Bachchan thanked his co-star Manoj Bajpai saying, “I just copied you”. He also dedicated the award to his daughter Shweta on her marriage anniversary saying, “Tomorrow morning when your children get up tell them Nana got the award”. Big B’s better-half Jaya also bagged the Best Supporting actress for her performance in “Kabhie Khushi Kabhie Gham”. Karan Johar also bagged Best Dialogue award for the film. Among other award winners included Bipasha Basu for her Sensational Debut in “Ajnabi”, while another co-star Akshay Kumar walked away with Best Performance as a villain. Ranjit Barot bagged Best Background music for “Aks” and Tusshar Kapoor the Debutant Actor Award for “Mukje Kuch Kehna Hai”. The stage performance by Diya Mirza, Arjun Rampal, Amisha Patel, Urmila, Fardeen Khan and British band Right Said Fred were other highlights of the function. While in memory lane, tributes were paid to Ashok Kumar, Pradeep Kumar and the producer N.C. Sippy. Official sources said Ansari, who was again sent to the CBI custody for seven days, had made some revelations about the funding of arms consignment and also about parting with some of his booty earned from kidnappings with Omar Saeed Sheikh, one of the Jaish-e-Mohammed leaders arrested by Pakistan in connection with the kidnapping of American journalist Daniel Pearl. 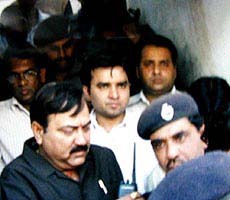 As per the statement of Asif Reza Khan, which was recorded before his death in an encounter with the Gujarat police while he tried to flee from the custody, the funds parted by Ansari to Sheikh had been sent to Mohammed Atta, leader of the militant group that carried out the suicide attacks on September 11 in the USA. It has been an unremitting tale of fiscal woes. Interestingly, quite a few economists and experts point their accusing finger at ruling BJP politicians and top bureaucrats instead of on recurrent famines, floods and earthquakes for such a mess! “The Kutch earthquake in 2001 all but emptied the state’s treasury: but huge loans from the Asian Development Bank (ADB) meant for relief operations in Kutch were never spent judiciously by the administration here. This resulted in inflated work estimates and reckless functioning draining the state’s budget,” said Mr Babubhai Meghji Shah, former Finance Minister of Gujarat. Babubhai is also a former Member of Parliament from Kutch (BJP). Talking to IPA at his quake-affected native village Lakadia of Bhachau taluka, Babubhai showed some budgetary documents (2000-01) of the government to prove his point. 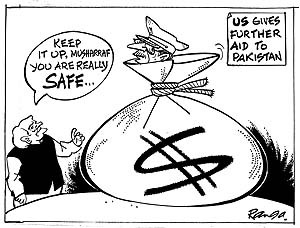 He accused the government of playing havoc with crores of rupees in the name of quake relief. Obviously, the corruption too has acquired astronomical proportions. The cost of laying a pipeline comes to Rs 20 lakh per km now instead of the normal cost of Rs 5 lakh for the same before! Referring to Kutch, he said, Rs 670 crore was borrowed from ADB in the name of laying and repairing long-route water pipelines. Rupees 470 crore out of that amount is yet to be spent. Giving another instance, he said the pipeline to Khadir point from Rapar taluka was estimated to cost Rs 8 crore. Incidentally, the pipeline work has been going on since 1985-86. However, the whole line has been found to be technically defective defeating the very purpose of the project. Consequently, no village is getting water supply. This scheme has proved to be a white elephant! He showed dozens of collapsed houses in Lakadia and surrounding villages, with debris still lying there. “One of the most-talked-about scandals in the so-called rehabilitation work here was the government’s decision to dump tin sheets on Kutch which are lying everywhere unutilised,” he complained. These sheets were simply not adequate to meet the demands of the situation (10 sheets for a victim). “In fact, a big quantity of sheets was found in an open market in far away Jetpur town of Saurashtra. Police investigations revealed that these had been sold out not by the victims but by some agents!” There are also reports of relief material, including tents, medical supplies, tin food cans and blankets being sold to distant markets. The Planning Commission, he said, had allotted Rs 480 crore to provide clean water to 1,500 scarcity-hit villages in the Eighth Plan. But the number of water-scarce villages went up to 3,000 last year while the allotment too mysteriously went up to Rs 3,000 crore in the Ninth Plan. One would have thought that at least a few areas would benefit. But it has not. Instead, the project has created only “temporary provision of tanker supplied water” to villages, without any permanent facility. Disagreeing that only the politicians, both at the national and the state levels, were to be blamed for the sorry state of affairs, Tully said: “On the contrary, the people who run these political institutions are to be blamed. The politicians, though corrupt, are only a part of the entire process. Welcoming the suggestion that there was a need for participation in politics by the common people instead of it being the domain of the elite, he underscored the need for a radical change in the mindset of members of the Indian Administrative Service and the Indian Police Service. He said though India had immense potential in all respects, be it natural or human resources, this had not been harnessed to the optimum level due to various reasons. The internationally-famed British journalist said his book dealing with all these issues was scheduled to hit the stands in September. Commenting on the legality of the Tehelka-type investigative journalism, Tully said such acts were common and legal in western countries when hidden recordings become the only option to do a story. “But you have to be very alert and careful all the way,” he said. However, he was critical of the way the present Tehelka investigation was proceeding, saying that it had now become an inquiry on tehelka.com itself. A change in uniform for women police officers figures on the agenda of the first national conference for women in police. The three-day conference is aimed at forging a new future for women in police who constitute a little less than 3 per cent of the 13 lakh-strong police force in the country. Minister of State for Home, I.D. Swamy will inaugurate the conference at Vigyan Bhavan here on Tuesday. Over 200 policewomen across all ranks in India are expected to participate in the conference being organised by the Bureau of Police Research & Development and the British Council with support from the British High Commission. Addressing mediapersons at Police Headquarters here on Sunday, Dr Bedi said the uniform needs of women police officers will be addressed for the first time. Dr Bedi said the conference will address four major themes: strategic management approach for dealing with gender issues, personal and professional development of women in police, perception of men and women, family and community towards women in police and formation of a national forum for women in police. Rina Mitra, IPS officer from the Madhya Pradesh cadre and one of the six conveners of the national conference said the demand for a change in uniform was made at all the four regional workshops held at Phillaur, Bhopal, Hyderabad and Kolkatta. Director Vigilance (Police), Railway Board, Ms Mitra termed the change in uniform as one of the “big agendas” of the conference. Kamal Singh, Head, Governance and Social Justice (India) and project partner said that students of the National Institute of Fashion Technology have been asked to participate in the competition to design uniforms after interacting with policewomen and understanding their multiple roles. She said that the selected portfolio will be forwarded to the Bureau of Police Research and Development. In another development, the very provision inserted through an amendment in the Madhya Pradesh Panchayati Raj Act, 1993, has been challenged in the high court as ultra vires of the Constitution. The amended Act stipulates that if a person with two or more living children has another child on or after January 26,2001, he or she will become ineligible for holding an office in a local self-government body. President of Sagar Janpad Panchayat Harbachan Singh Rathore has argued in his petition in the high court at Jabalpur that the amendment in Section 36 of the Madhya Pradesh Panchayati Raj Act, 1993, and the rules made there under, contravene the Constitutional right to life and liberty. Besides, the Preamble to the Panchayati Raj Act does not cite birth control as one of its objects. A Division Bench comprising Justice Rajeev Gupta and Justice Usha Shukla has issued notices to the Collector of Sagar and others. The Collector had issued on February 4 a notice under the provision of the Act to Mr Rathore on the birth of his third child on January 24. Mrs Sudama is the Sarpanch while her husband Vasant Saryam is a panch of the Palatvada village panchayat in Parasia tehsil of Chhindwara district. They had two daughters and a third child was born to them on November 18. Soon afterwards, Mrs Sudama gave her second daughter for adoption and claims that she and her husband are not covered by the ineligibility provision of the Panchayati Raj Act. Mrs Shashi Yadav was the first victim of the amended Panchayati Raj Act. She had two children when she became Sarpanch of the Kanavati village panchayat in Neemuch district. While holding that office, she gave birth to a son, her third offspring, on September 25 last year, thus attracting the ineligibility provision of the Act. They were prima facie found negligent in their duty by an inquiry team of senior BSF officials probing the incident under which smuggled RDX, arms, ammunition and drugs in large quantity were seized at Kinkiyani village in Jaisalmer and in the Kelnor area of Barmer district last month, the sources said here. Further probe was on, they said. Four of the suspended BSF personnel were constables.